It’s been a while since I last wrote on here and that doesn’t mean that I’ve not had stuff to add, more that I seem to have been too busy recently to actually sit down and write a post. So all being well there should be a couple more before the end of the year to try and catch up a little. 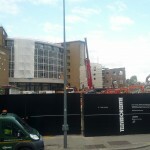 My last update on Television Centre was back in August and while since then work has continued on the site, the number of times I am actually working in the area has dropped significantly. So my opportunities to get new photos have reduced, however I have managed to capture some on my way past. However before I add my photos, here’s a YouTube video that I was pointed at from July. This shows the early stages of the demolition work, with TC4 having no roof at all and work only just getting underway on the Spur and Stage 5. 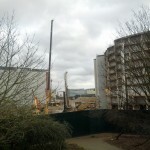 Firstly a panorama showing the main block and run towards stage 6 showing the demolition of the Spur and Stage 5 is well advanced. 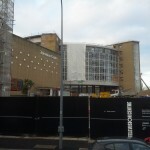 Then fast forward another couple of months and the demolition of this section of the building is pretty ,much complete. For a while there was a huge (multiple stories high) pile of rubble in the middle of what had been the doughnut, but now most of that has been removed. At the front of the site running along between TC1 and Wood Lane the construction of the first of the apartments on the site looks nearly complete. I suspect this will be used as the sales office for the whole site initially. 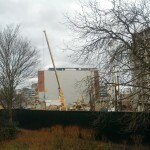 So firstly a similar panorama to the one from October showing much much further the demolition has got…. …. 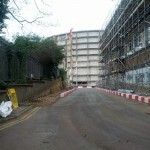 and then some other photos of both the front and the back of the site. What is clear walking through the park is that the demolition of the main and restaurant blocks appear to be pretty much complete. There are now pile drivers starting to appear which suggests the next stage is underway. 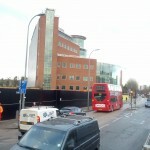 Many of the buildings outside the ring road on the rear of the site are still in place. 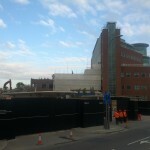 View from Wood Lane of the main section of the site, with the gap where the Spur used to be. 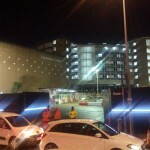 The other end of the gap with Stage 6 as a stand alone building. The gap where the Spur and Stage 5 used to be. View of the back wall of Stage 6. 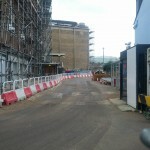 Looking from Frithville gate towards where the entrance to the inner ring road and TC 4 used to be. 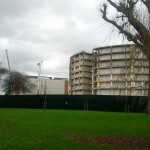 And a final note – on Martin Kempton’s wonderful history of Television Studios website there are a few more photos of the site on the page about Television Centre. Scroll all the way to almost the bottom to find them, however the whole page is well worth a read if you haven’t previously.